When, where and what we can expect from the world's biggest creative conference in 2019. Adobe MAX 2019 might seem a while off, but it'll soon be that time again where the world's most creative minds gather for a week of inspirational creativity. Adobe MAX 2018 is going to be hard to beat, the largest audience Adobe has ever seen, almost 15,000 attendees witnessed some Adobe's most impressive innovations to date and heard from some of the creative industry's brightest minds. But in our experience of the guys at Adobe, just when you think they can't possibly top something, they do just that, so we have super-high hopes for this year's conference. Adobe MAX 2019: when and where? Adobe MAX 2019 takes place on the 4-6 November (preconference 2-3) in Los Angeles. The same as last year, the conference will be held across various locations in the Los Angeles Convention Centre. Sign up before 30 April 2019 to save $500 on a full conference pass (conditions apply). As we mentioned earlier, last year's conference was a huge success. Here's a little reminder of some of the incredible innovations revealed last year. The Adobe team wowed crowds with details of Photoshop CC arriving on the iPad. With all the core tools of Photoshop CC, Photoshop for iPad is optimised specifically for touch devices, making the most of gestures, and the Pencil, with a new user interface designed especially for the iPad. 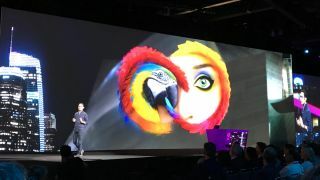 Adobe also revealed it would sync across devices, so you’ll be able to switch between working on desktop/iPad with ease. The Project Aero demo last year blew our minds as Adobe senior product manager Zorana Gee wowed the audience will truly jaw-dropping augmented reality projects. "AR is the next breakthrough medium for creative storytelling," said Gee. We genuinely cannot wait to see what Adobe will do with this technology in 2019. Kyle T. Webster took to the stage last year to demonstrate Adobe's all-new painting and drawing app Project Gemini. And boy, was it impressive. We're still waiting for Gemini to be released, with Adobe promising at MAX 2018 that 2019 would be the year it arrives to the masses. Another crowd pleaser last year, voice prototyping for Adobe XD, enabling designers to create prototypes for voice-activated devices. New voice trigger and speech playback capabilities enable designers to move seamlessly between voice and screen prototyping: users can now add voice triggers that launch particular interactions (in the same way a tap or click would), while speech playback unlocks a powerful text-to-speech engine. Adobe's long-awaited video editing app, dubbed Project Rush, was finally released at MAX 2018. And to quite the reception. It will be really interesting to see how Rush develops over the course of this year. And whether plans to extend it beyond just iOS are in motion.